Scientists are to investigate whether eating chocolate can reduce the risk of heart disease in women with diabetes. Volunteers - postmenopausal women with type 2 diabetes - will be asked to eat a bar of chocolate a day for a year. Cocoa is rich in compounds called flavonoids, which are thought to benefit the heart. The University of East Anglia is using a specially formulated form of chocolate which contains more flavonoids than usual. 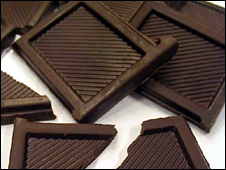 This compensates for the fact that many flavonoids are destroyed in the process of turning cocoa into chocolate. Soy - another source of flavonoids - has also been added to the special bars. The scientists are testing the theory that adding flavonoids to the diet may give added protection against heart disease on top of that provided by prescription drugs. Deaths due to heart disease among women increase rapidly after the menopause and having type 2 diabetes increases this risk by a further three-and-a-half times. If the trial confirms the hypothesis then it could have a far-reaching impact on the advice given to at-risk women. Lead researcher Professor Aedin Cassidy said: "Despite postmenopausal women being at a similar risk to men for developing cardiovascular disease, to date they are under-represented in clinical trials. "We hope to show that adding flavonoids to their diets will provide additional protection from heart disease and give women the opportunity to take more control over reducing their risk of heart disease in the future." The researchers aim to recruit 150 women under the age of 70 with type 2 diabetes who have not had a period for at least a year, and who have been taking cholesterol-lowering statin drugs for at least 12 months. Dr Iain Frame, director of research at the charity Diabetes UK, said: "We certainly don't advise people to start eating a lot of chocolate as it is very high in sugar and fat. "We would always recommend that people with diabetes eat a diet low in fat, salt and sugar with plenty of fruit and vegetables." "However, there are compounds found in chocolate, called flavonoids, that are thought to provide some protection from heart disease. "A successful outcome of this research would hopefully mean being able to offer people at high risk better protection over and above that provided by conventional drugs." For details of the trial contact Andrea Brown or Dr Peter Curtis at FLAVO@uea.ac.uk.